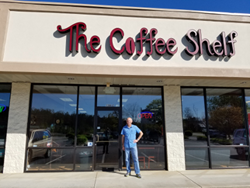 The Coffee Shelf in Chapin, South Carolina has joined the community of independent coffee houses, cafes and bakeries supported by Crimson Cup Coffee & Tea. The Columbus, Ohio coffee roaster was named 2016 Macro Roaster of the Year by Roast magazine, in part for its work in helping entrepreneurs like Jerry Caldwell learn how to open a coffee shop. Training entrepreneurs like Jerry to create unique, independent coffee shops is a big part of our success as a specialty coffee roaster and coffee franchise alternative. Columbus, Ohio coffee roaster Crimson Cup Coffee & Tea, Roast magazine’s 2016 Macro Roaster of the Year, recently welcomed The Coffee Shelf to the growing community of independent coffee houses, cafés and bakeries that serve Crimson Cup beverages. Located at 130 Amicks Ferry Rd. in the lakefront community of Chapin, South Carolina, the store celebrated its grand opening on May 10. “I wanted to create a warm and relaxing setting for our community while combining my twin passion for books and coffee,” said Coffee Shelf Owner Jerry Caldwell. Customers can page through the latest bestsellers, cookbooks, comic books and more while enjoying hot, iced and frozen espresso-based drinks, including lattes, mochas and cappuccinos. Fresh-baked muffins, pastries and cookies round out the menu. Caldwell retired from the U.S. Marine Corps after 20 years as helicopter pilot. After working as a sales person in the aircraft industry for a number of years, he decided to take on the challenge of becoming his own boss. He turned to Crimson Cup and its 7 Steps to Success coffee franchise alternative program to learn how to open his own independent coffee shop. 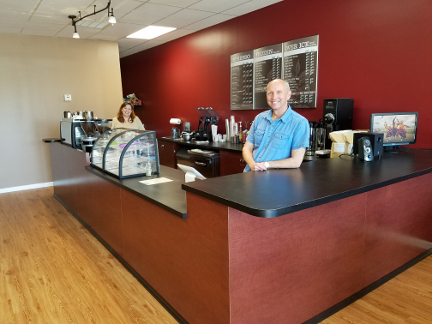 Based on Ubert’s book Seven Steps to Success in the Specialty Coffee Industry, the program provides everything new business owners need to open and operate a successful coffee house. In client surveys, Crimson Cup has found that 85 percent of coffee-shop customers completing the 7 Steps to Success training program have been in business for five years or longer. By comparison, federal government statistics show that half of all new restaurants – including independent coffee shops – close within three years of opening. Caldwell said he chose Crimson Cup because of the roaster’s outstanding coffee and its Friend2Farmer direct trade program, which supports small coffee farmers and their communities by paying a higher-than-market price for their coffee and investing in education and other initiatives. He plans to add brew bar features in the future so that the shop can offer hand-poured craft coffees from around the world. In the weeks since The Coffee Shelf first opened its doors in April, it has become a fixture in the local community. "I want this to be a place where people go and remember they've been here," Caldwell said. An open seating area with plenty of chairs invites customers to sit and enjoy their favorite books and beverages. The Coffee Shelf also has space for book clubs and book-signing events, and Caldwell plans to hold poetry slams and music nights.